PHP developer salary is diverse all over the world. It is affected by lots of factors starting from location and ending with the scope of work. What should a buyer know while choosing any programmer? What should beginners to PHP know about salaries before getting started to learn this technology? We’ll try to answer your questions in this article. PHP is used for general purposes in web development. This article is not about the technology itself. We’ll talk about how much a PHP specialist earns per year or month in different countries of the world. This data is of great interest to both programmers and their employers that want to stay updated about the rates. We chose 6 countries to compare and contrast PHP salaries in diverse regions of the globe. 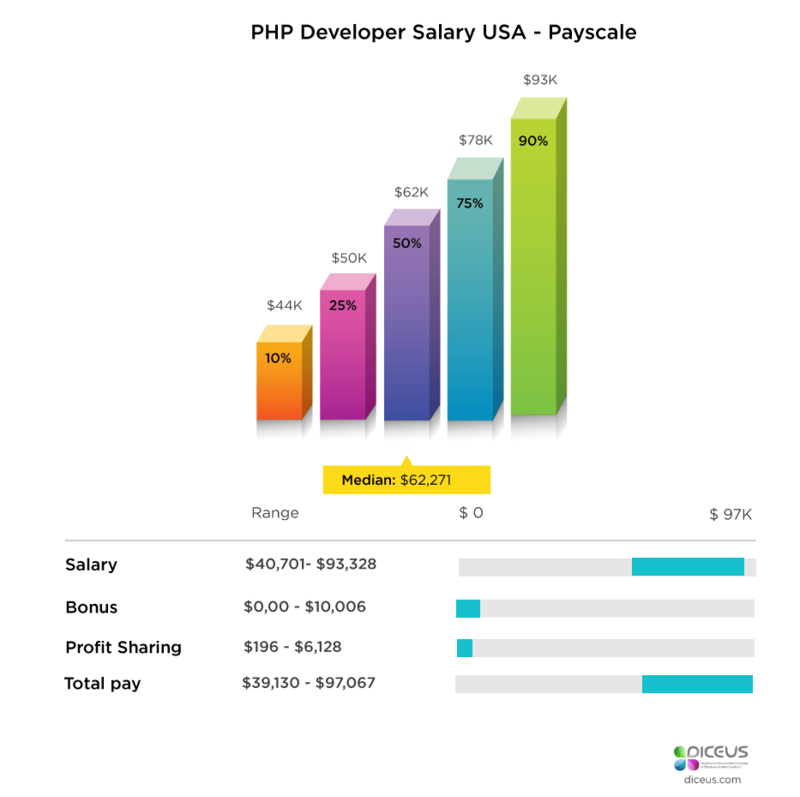 Research based on several websites with job posts shows that the median salary for PHP programmers is diverse in the USA. This diversity is caused by a different number of individuals who report how much they earn, location, and level of expertise. For example, Indeed reports $85,936 per year, as of March 28, 2018. Around 41K employees submitted their salaries to the website. Below is a chart demonstrating the distribution of wages. Other trusted source Payscale shows different data. Median for PHP specialists is $62,271, as of March 26, 2018. If compared, it’s much less than the amount on Indeed. Here’s a clue. Payscale reported this wages based on only 895 individual data that is far less than on Indeed. 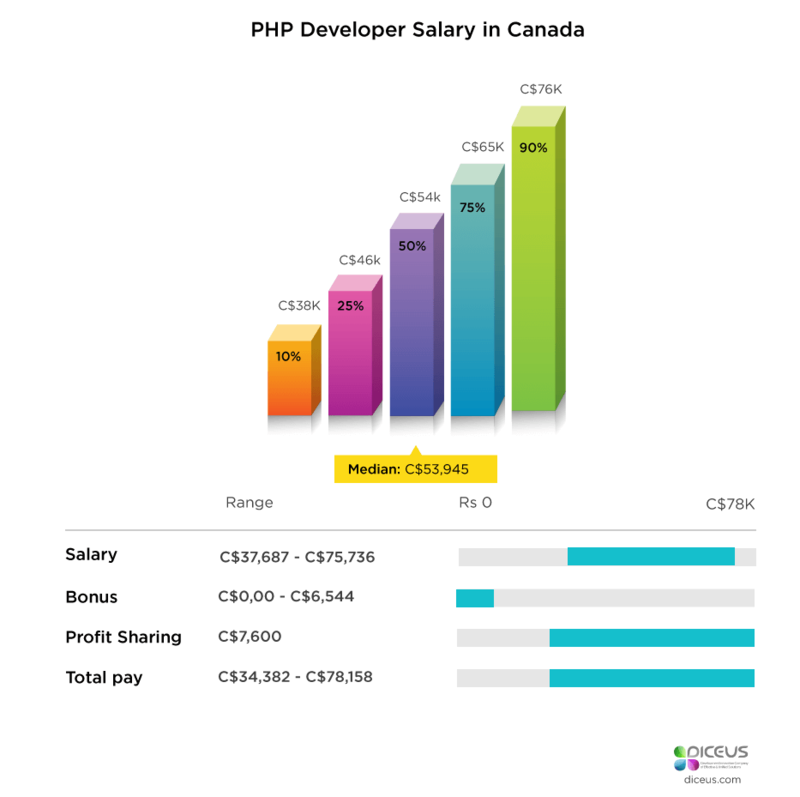 The salaries for PHP programmers in Canada begin from C$38,000 and end with C$76,000. According to Payscale, the median is C$53,945. As of March 24, 2018, a PHP developer makes around 28,000 pounds per year which is approximately 39,000 dollars. This job is much more popular in larger cities such as London and Leeds, and less popular in smaller cities Southampton, Manchester, Nottingham. 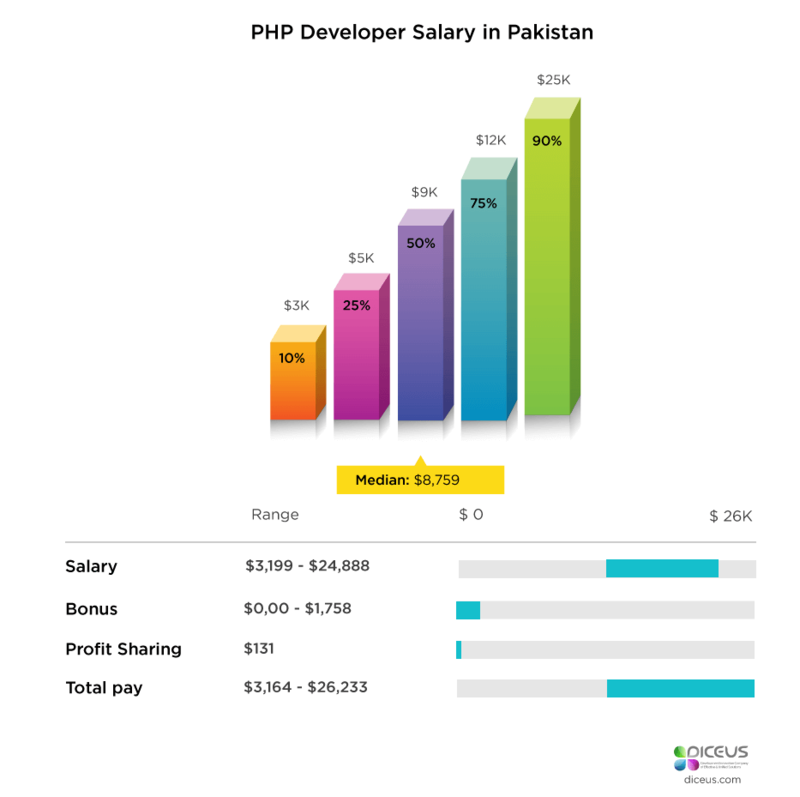 Pakistan developers earn around $9,000 per year on average. Entry-level employees earn around $3,000 whereas senior programmers make almost $25,000. The salaries in Pakistan are much lower than in the countries described earlier. Average gross salary around the country is $14,000. In the United Arab Emirates, PHP developers make approx. $20,000 per year. The wages start from $6,500 whereas the maximum salary is $48,000. Rates. 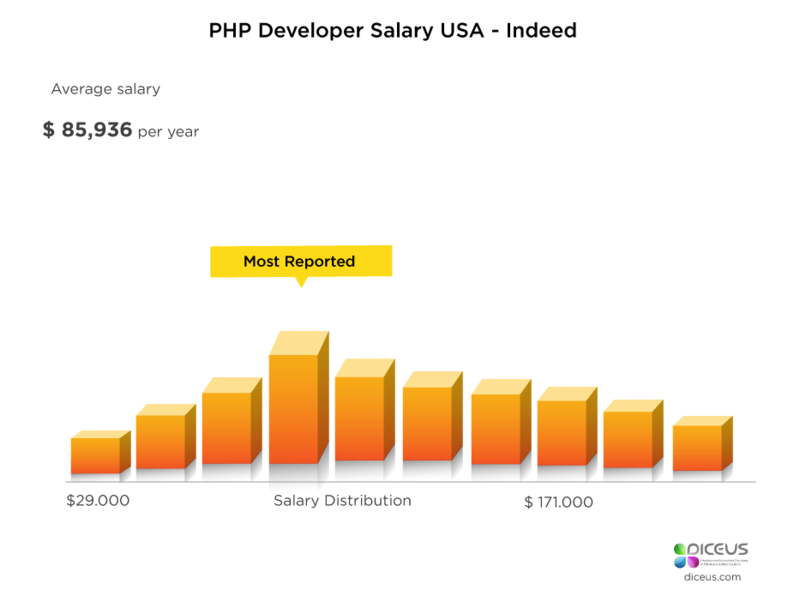 No matter what place you choose to start your search, you also should know the average amount of PHP developer salary for fresher. It will help you compare the prices and rates you are offered by a developer or a company. Depending on the location where you look for employees you may use the salaries data written above in the article. Please remember that rates depend on so many factors including location, level of expertise, team’s size, set of skills, etc. Before hiring a PHP developer for a long-lasting project, consider those factors and conduct a comprehensive research on rates. Expertise. Specialists with a junior level of expertise obviously earn less than senior experts. You should pay attention to a set of skills required for the accomplishment of your project. If you don’t need some specific additional services from a PHP developer you may easily hire a junior specialist. Technology. Focus on the core technology that will be used for the project development. When you identify the core technology it will be easy to identify other stacks required for the project. Our PHP technology stack is rather extensive. Our developers use different libraries and frameworks to deliver projects of any complexity. We offer a standard range of services that include custom development, integration, maintenance and tech support. We offer reasonable rates to our customers as well as special discounts for those participating in Diceus affiliate programs. Due to loyalty, we have a great number of repeat clients. Our company has a simple hiring process. First off, you should let us know about your needs and requirements. We define the best-match technology and select the right developers to your job. You will be able to interview them and look through our portfolio with the projects involving similar technologies. Sign up to receive more reports on salaries, latest technologies, and trends in IT.